Headphones are an essential tool for producers and musicians, as well as a beloved device for music enthusiasts. Today, studio headphones allow for the production, manipulation, and enjoyment of music in any location, from professional studios to your own home. Several companies offer a selection of high-tech headphones with a plenitude of useful features. Sennheiser is a revered name in the audio industry. This German-based company now operates in more than 90 countries, keeping innovation and high-level technology in mind throughout the production of their sweeping range of audio products, which includes top-notch headphones. The Sennheiser HD 280 Pro Headphones are a well-liked product which present a classic design and advanced capabilities. Continue reading to see if this device could be the right pick for you. Before spending a significant amount of money on a pair of headphones, keep some criteria in mind. Firstly, look at whether the design is closed-back, open-back, or semi-open. Closed-back models feature closed-off earcups that block out all background noise and don’t allow for any sound leakage, so people can’t hear what you are listening to. This is great for recording tracks and simply listening to music, but can easily cause ear fatigue after hours of use. Open-back options allow for all sound to leak out, being heard by anyone near you. While this offers little privacy, it creates a realistic and large quality of sound unmatched by other designs, making the setup ideal for mixing. Semi-open headphones are a combination of open and closed-back models, letting a only portion of sound to escape. With this type of headphone, you enjoy more privacy than with open earcups as well as a somewhat larger and more realistic sound than with closed earcups. The HD 280 Pro Headphones are a leading product from Sennheiser. This device has earned a rating of 4.3 out of 5 stars on Amazon, averaged from the input of over 2,400 customers. These headphones are closed-back, offering up to 32 dB attenuation of background noise. The earcups are circumaural for complete sound isolation. A lengthened frequency range of 8 - 25,000 Hz creates an authentic reproduction of sound. Additionally, compatibility with any device is ensured thanks to optimum impedance. The HD 280 Pros feature swiveling earcups and collapsibility to offer you versatility in any situation. Also, many of the parts are replaceable, namely the earpads and the cable. The cable is single sided and coiled with a 3.5mm mini jack. A locking ¼ “ adapter is included, enabling use with studio or home stereos. 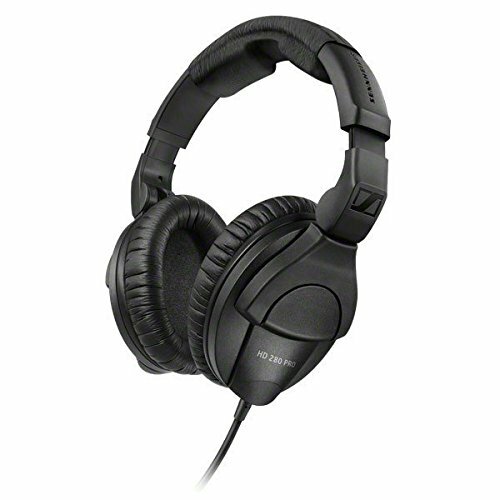 For around $100, the Sennheiser HD 280 Pro Headphones are one of the most popular and well-rounded options available. The closed-back and circumaural design creates a completely isolated listening experience for comfort and privacy. These headphones not only block out background sound to limit interferences, but also create a natural quality of sound with the wide frequency range. These Sennheiser headphones offer convenience in multiple ways. The collapsible structure means that the device can be stored in a compact fashion, and the replaceable parts ensure that it will last for years to come. With the swiveling earcups you can engage in single-ear listening or monitoring. These headphones can be used with nearly any device, including cell phones and tablets, without sacrificing high-quality sound. You can even connect the HD 280 Pros to home stereo systems with the included adapter. The HD 280 Pros have a few downsides. While the closed-off design has many benefits, it also makes the user more susceptible to hearing damage. Also, the headband is not completely padded, which can cause discomfort. These expert-level headphones are backed by thousands of positive customer reviews, as well as Sennheiser’s fantastic reputation, making them a dependable option for people of different backgrounds and budgets. Whether you are a professional in the audio field or a casual music listener, a pair of headphones can be a wonderful addition to your day-to-day life. The Sennheiser HD 280 Pros are one example of high-level headphones, with a variety of technical features and a well-designed structure. And, for a device of their caliber, the HD 280 Pros are a great value.